This is going to be a pretty technical post. If you’re from a clinical background, then the key take-away is that SMART is a healthcare-specific implementation of OAuth2, with the goal of creating a secure way of sharing what can be extremely sensitive data in a manner that uses standard industry protocols. The SMART stuff can cover off a lot of different scenarios (see the on-line documentation for more details), and I think it’s going to be an important underpinning of the health care ecosystem. The specific scenario that I’m supporting is where I’m a user logged into an EMR/EHR system, and I want to use an external application to do cool stuff with my data – in this case a paediatric charting app provided by the SMART team. There are many ways of doing this – but as far as I am aware, they all use bespoke rather than standard solutions – and that won’t wash in an ecosystem. Just to set the background – here’s a picture of the overall architecture. It’s a web-based application served off a Tomcat server which exposes FHIR data endpoints and the OAuth endpoints (that are the real subject of this post). The SMART app is deployed off an external server, and runs in an iFrame on the page. The Tomcat server does have some local data storage, but accesses external FHIR servers (eg Blaze) so is acing as a ‘facade’ or a ‘proxy’ to those services (once the app has been authenticated). The job was made a bit more complex, because I wanted to move to using Maven as the basis of my Java work. James assured me that the gain was worth the pain – and he was right – but it did slow things down a bit. (He paid the price by having to support me through my trials and tribulations though…). Having done that, I created a new project based on the “maven-archetype-webapp” archetype. (btw – archetype is a rather overloaded term in our space – my friend Koray might take issue with its use here!). I configured the maven pom.xml file (that’s the maven config file in the application) to download HAPI. Then, I moved the FHIR endpoints across. 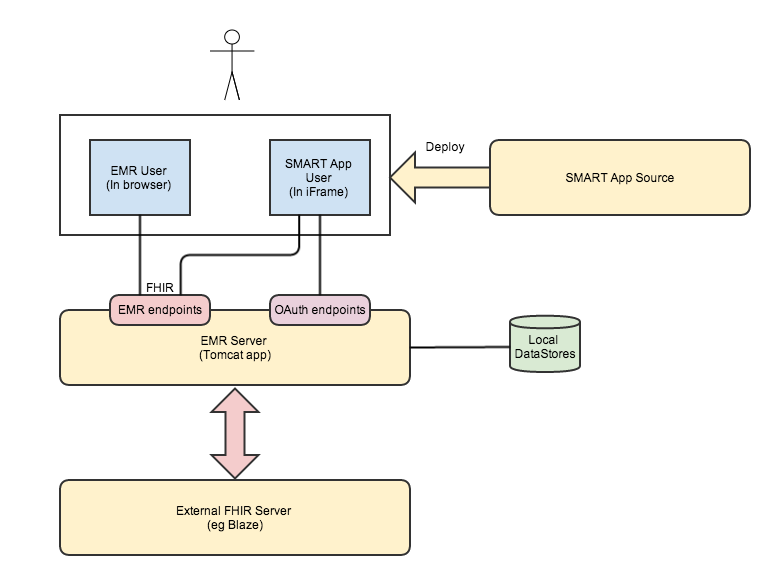 From the EMR web page, create an iframe, and direct that to the SMART application, passing across some initial config. The SMART applications loads and reads the conformance statement from my server so it knows how to find the authorization and token end points. It then calls the authorization end point, including the scopes (what it wants to do). Assuming that it passes authorization, the endpoint re-directs back to the SMART application passing across an Authorization Code. The SMART application then calls the token endpoint, passing in the auth code it just received – and receives back the Authorization Token. It then calls the EMR FHIR endpoints (including the Auth Token in the call) to get the data it needs, and renders the display to the user. Note that be default all end points (Authorization, Token and FHIR) are hosted off the same server. I’m not sure if they HAVE to be – perhaps I should experiment with that. So the first step is to set up the Authorization and Token end points, and then tell the SMART application where they are. This is done by using some extensions to the Conformance resource for the server. Create a basic ‘login’ function from my sample EMR application. It’s quite simple – the user sends login details to a login endpoint, which validates them, and creates a user token that is saved on the server in a context object, and sent back to the local app which it will include with the launch call. (I originally tried to use the session capabilities of tomcat, but these are all ajax calls, and it doesn’t work so well). Because the user of the system (as opposed to the SMART app user) also needs to access protected resources, they get an access token created as well. //we'll use the user token as the launch token as we can use that to validate the Auth call..
Next up is the authorization end-point. The launch token (actually the user token in this case) is part of the scope, so we pull that out to make sure the request came from a valid source and then redirect to the applications redirect_url. In reality, we’d check that the scope was acceptable (in fact – deciding on a standardized set of scopes is going to be one of the many excellent outcomes of the SMART initiative) . Note that we redirect to the applications callback – just as OAuth2 dictates – on successful authentication. We could choose to have a registration process that stores the application id and call-back url locally to further improve security. //is this a valid access code? //the auth codes don't match. So now that we have a valid auth token, we can make calls of the actual FHIR endpoint. I’sure that there will be further enhancements in HAPI to make this easier, so for the moment I’ve taken a simple step of overriding the ‘handleRequest’ method in the RestfulServer to check that there is a valid access token whenever anyone tries to access a FHIR clinical resource. (We let the conformance query pass of course, as that’s needed way back at the beginning so the external app knows where our auth and token end points are). Now, this is not the only way of doing it (by any stretch of the imagination) – and the code is hardly production quality – but I do think that it shows that it’s reasonably straight forward to apply OAuth2 to protecting health data. And I’m sure that the different solutions that people come up with (as well as this one) will be properly hammered at connectathon! Good post, David. With respect to providing the OAuth2 endpoints via extensions to the Conformance resource, has consideration been given to include these as defined datatypes within the Security element? Otherwise, a SMART app (or any other consumer) would need to parse out the URIs to find the authorization endpoint.